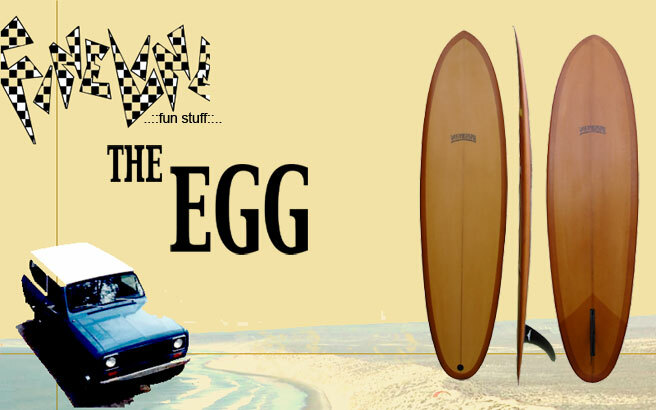 The Egg is a super easy to ride modified hull. He has more tail rocker and a more modern down rail than his demanding cousins. With a taste of S-Deck, these boards carry a lot less nose volume than your average funboard.The result is alot of tail turnability; but the front end has a taste of the hull humm, along with an amazing capacity for the soul trim. I shape ‘em anywhere from 6’0 to 9’0; obviously, they’re modified to best fit the size of the shape, but the popular sizes are between 7’0 and 8’0, such as the one pictured here, 7’6”, 16 1/2 X 21 5/8 X 15 3/8 X 2 7/8. The fin can play a big role on this board- pictured is a Frye flex 8.5; the Greenough 4A or an L-Flex also work great.